The NBA combine used to be the only venue of its kind for prospects to impress general managers, scouts and other pro basketball personnel before the draft, but the next best thing is now available for college players. The second annual Professional Basketball Combine will take place May 22 and 23 at IMG Academy in Florida. 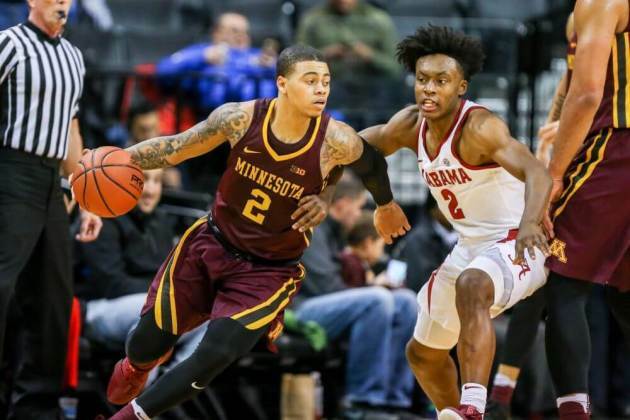 One of the 24 participants this year will be former Gophers guard Nate Mason, which was announced Friday morning. Mason wasn’t invited to the NBA combine next week in Chicago, but the All-Big Ten point guard still has a chance to impress NBA and NBA G League teams through similar combine testing, workouts, scrimmages and interviews later this month at the PBC. The 6-foot-2, 185-pound Georgia native averaged 16.7 points and 4.2 assists as a senior this season, finishing fifth in program history in career scoring and second in assists. Mason also helped his Big Ten team win a 3-on-3 national championship at the Final Four in San Antonio last month. Four of the 23 players from the inaugural PBC event last year received two-way contracts in the NBA, including former LSU guard and NBA G League rookie of the year Antonio Blakeney. Among the more than dozen players from the combine to play in the G League was former Indiana guard James Blackmon Jr.
Other players currently invited to participate in the PBC this year, include LSU's Brandon Sampson, Providence forward Rodney Bullock and Mount St. Mary's point guard Junior Robinson. The PBC players each have a donation site to raise money for the PeacePlayers organization, which focuses on building opportunities and leadership programs for youth in urban areas across the country. Mason's fundraising page is here. Gophers basketball: Who's in, who's out since last season?